For basecamp use many styles and sizes of tents are suitable, but while on a route bivy tents are the standard form of shelter. Bivy tents always have a single-wall construction because this maximizes the amount of interior space relative to the size of the tent’s footprint. Bivy tents must be as small as comfortably possible both to reduce weight and because a smaller footprint means the tent can be used on smaller ledges. Any bivy tent worthy of bringing on route should weigh no more than 2 kg, and ideally less. The one bivy tent that stands out as being distinctly lighter than all the others is the Black Diamond Firstlight at only 1.2 kg (and less once the mosquito netting is cut off). This tent is made from Epic fabric, which is much lighter than the standard membrane-based tent fabric and much more breathable as well. However, the Epic fabric is definitely less waterproof, and the poles in the Firstlight are also thinner, so it is not the ideal tent in which to sit out a big storm. Nonetheless, for most alpine-style climbs you are waiting until the weather looks favorable and hoping to finish the route before the weather deteriorates, so the weight of the Firstlight makes it an excellent choice, especially in situations when any precipitation will surely be only snow rather than rain. 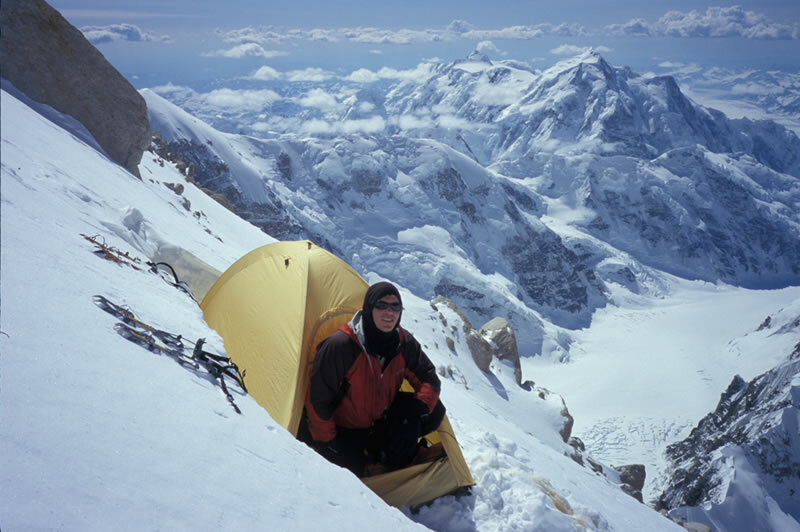 Bivy tent – Mark Westman in a Firstlight Tent on the Denali Diamond. Photo by Colin Haley. The shelter provided by a bivy sack is pathetic in comparison to a bivy tent, and as a general rule you should always bring a tent if you think you will find or create ledges large enough to pitch it. After all, the weight of the Firstlight is actually less than the combined weight of two standard bivy sacks. However, on routes that are consistently very steep it may be impossible to find a ledge large enough for a tent, and if chopping a ledge from an ice slope, it is easier to chop one long, narrow platform than it is to chop a short, wide platform that would be necessary for a tent. If you don’t think you will be able to use a tent, the next consideration is whether to bring bivy sacks or just sleeping bags alone. If trying to go really light and fast, just taking sleeping bags can be a decent option. The bivy sack will add only a tiny amount of warmth, and is really only necessary in the event of precipitation or spindrift. Bivy sacks have limited usefulness, but for routes where tents are impossible to use, and the possibility of precipitation and/or spindrift seems likely, they are the logical conclusion. If bringing bivy sacks, the next choice is whether to bring a bivy sack that is only large enough to accommodate your sleeping bag, or a bivy sack that can accommodate your sleeping bag, sleeping pad, backpack, and boots. The later is obviously made of more fabric and therefore heavier, but will keep you and your equipment much drier if you are indeed getting doused with snow. In order to save weight on your bivy sack, the best sacrifice to be made is durability. Several models of bivy sacks are available today with ultralight fabrics that won’t stand up to being scraped across rocks, but will work excellently until that happens. Ultralight sil-nylon tarps can be a wise choice for routes on which you choose to bring no tent or bivy sacks. They weigh very little and can be used in conjunction with sleeping bags, or even just to block the wind if you are bivying out without sleeping bags. The best designs are shaped somewhat like an old A-frame tent, but without a floor. These can be easily clipped to an anchor above the ledge and pulled over you like a sack, while a standard rectangular-shaped tarp is difficult to use effectively in vertical or windy situations. The sil-nylon does not breathe at all, so it is important to have a little bit of ventilation, and even so a lot of frost will form on the inside of the tarp. Single sleeping bags on a ledge too small for a tent – Jed Brown and Colin Haley on the first ascent of The Entropy Wall, Mt. Moffit, Alaska. Photo by Jed Brown. When choosing a sleeping bag for a climb, the most important choice is down or synthetic insulation. Neither choice is ideal for all situations, and both have significant drawbacks and advantages. By far the biggest advantage of down is that it has a vastly superior warmth-to-weight ratio. It is also far more compressible than synthetic and retains its loft for years (while even the best synthetic insulations lose a lot of warmth in only a couple years). Unfortunately, down loses a lot of warmth when it gets wet, and even with good weather your down bag will slowly accumulate moisture with repeated bivies. The first deciding factor is climate – it is relatively easy for down to stay dry on a route in Peru, but much harder for down to stay dry on a multi-day route in the Cascades in winter. The second deciding factor is the amount of time you expect to spend on a route. If you are only planning on one bivy then down is always the correct choice, and if only two bivies then down is usually still the correct choice. The longer you plan to spend on a route, especially in a wet climate, the more it makes sense to bring a synthetic bag, which will retain at least some warmth no matter how wet or frozen it is. Double sleeping bag – Mark Westman and Colin Haley getting cozy in a prototype Feathered Friends ‘Spoonbill’ on the Denali Diamond. Photo by Colin Haley. Two-person sleeping bags are surprisingly difficult to find on the market, but provide the absolute best warmth to weight ratio for a bivy system. A well-designed double bag that weighs X kg will be warmer than sleeping alone in a single bag of the same weight – more warmth for half the weight! This is mostly because heat is shared between two people in a double bag, and also because a double bag saves weight by having no insulation on the bottom (just a layer of nylon). Sharing a sleeping bag is a little bit less restful than sleeping in your own, and homophobes will be too scared to even consider it, but the weight-saving advantages are very significant. The biggest problem with double bags is reduced versatility – a double sleeping bag requires that both climbers sleep side-to-side. If bivying on a steep wall it is common for each climber to find a separate small platform, in which case using a double bag is obviously not possible. A good rule of thumb is to bring a double bag on a route that you would bring a tent on, and bring single sleeping bags on a route where pitching a tent is perhaps not possible. The importance of a good sleeping pad is often seriously underestimated by many climbers, and they will have a cold, restless bivy because of it. Heat is lost by conduction to the snow faster than by radiation to the air, and adequate insulation between you and snow is very important. A really warm sleeping bag will not keep you warm at all if used with an inadequate pad. The foam in your backpack is useful insulation, but is most suitably used in conjunction with a real sleeping pad, not as a replacement for a real sleeping pad. Closed-cell foam pads are the trusty standard. A dense foam, with bubbles too small to see, will be the most effective insulator – Evazotte is the best to my knowledge. Avoid foam pads with bumps or ridges because it is impossible to brush off the snow between the ridges and they will slowly melt into your sleeping bag insulation. Thermarests were once too heavy to consider bringing on a route, but the newer ‘Prolite’ models are quite lightweight. The bigger advantage of Thermarests is that they are much less bulky than foam and can be easily kept inside your pack instead of strapped to the outside. Thermarests are unfortunately much slipperier than foam and thus not very suitable for sleeping on sloped ledges. Also, there is always the danger of puncturing your Thermarest while on route. Great advice! Im off to the Alps this summer for my third trip but not sure how far my budget will take me in huts. So might be bivying, my bivy bag has served me well snow holing in Scotland but without taking my ridiculously heavy synthetic winter bag I think I might be in for some cold nights. I’m off to see if I can fit myself my bag and all my gear in my bivy now! !